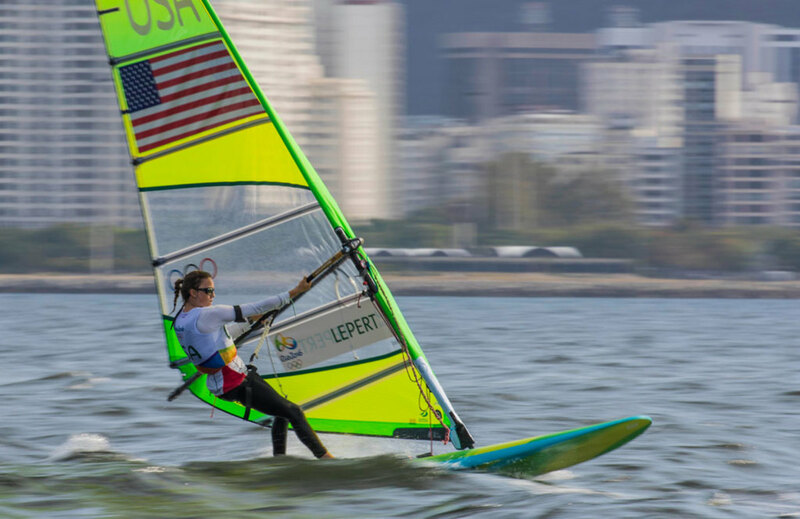 The U.S. sailing team knew going into the 2016 Olympics that the winds on Rio’s Guanabara Bay are often quite light. The team also knew it was going to have to battle for every place in every class in every race if it was to bring home any medals. And on Day 2 of the regatta, a challenging one with fluky breezes across both courses, it was more evident than ever that there will be few if any gimmes during the next week and a half of sailing. As evidence of how tough it was, current world champion Giles Scott of Great Britain—widely acknowledged as the odds-on favorite to get a gold—finished in an almost shocking 17th place in the very first race for the Finn class. Basically, he fell back into the second row as a result of a poor start and was never able to get back into the game after that. A mere 6 knots of breeze on the Pao de Acucar course, building to 9 knots toward the finish didn’t help. In the second race of the day (sailed in 8 knots of wind out of the southwest: fairly typically for Guanabara Bay this time of year) Scott finished a more characteristic third. Still, it’s safe to say, he’ll be taking nothing for granted after such a slow start. Leading the class after the first two races is Argentina’s Facundo Oleza, who won the first race and took 9th in the second—yet more evidence for how tough the racing was. U.S. Finn sailor Caleb Paine finished in 7th and 10th and is currently in seventh overall, not a bad start, although he’s clearly got some catching up to do. Farther to the north, conditions were also both challenging and light for the Laser and Laser Radial classes, with winds ranging from 14 knots to just 3 knots at times. For Charlie Buckingham it was largely a reprise of the opening day, as he finished in 10th and 23rd, making his overall record: 20, 7, 10 and 23. Meanwhile, for Laser Radial sailor Paige Railey, after coming back from a slow start to finish 2nd in yesterday’s Race 2 she finished a disappointing 10th and 21st in today’s two races, which took place in about 10 knots of breeze out of the south building to 12. Finally, on the Escola Naval course straddling the bay’s main channel, Olympic rookies Marion Lepert and Pedro Pascual in the women’s and men’s RS:X classes continued to get an education in what it means to compete at the brutally competitive Olympic level: with Pascual taking 37th in the fourth race of the series and failing to finish in Race 5; and Lepert, who finished 3rd in yesterday’s second race, finishing 13, 22 and 23.